The Story: Sea horses usually have a long dance of courtship before mating. They will move in sync and swim around each other. After a few seconds, the female puts the eggs into the males’ pouch through ovipositor to complete the fertilization. Unlike most species, the birth of the sea horses are done by males. This mating photo was taken in Minamatashi, Kumamotoken in Japan. 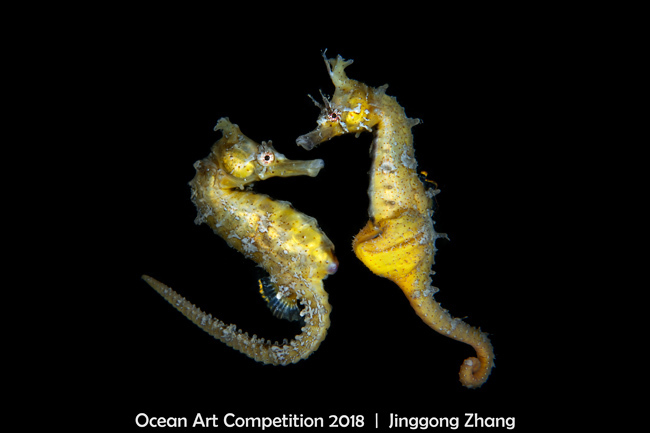 This species sea horses was officially recognized in 2017. To hide from natural enemies, sea horses usually swim out of hiding seaweed and mate at sunrise in the morning. After mating, they hide into the depths of seaweed immediately.